Where should I begin to tell the story? 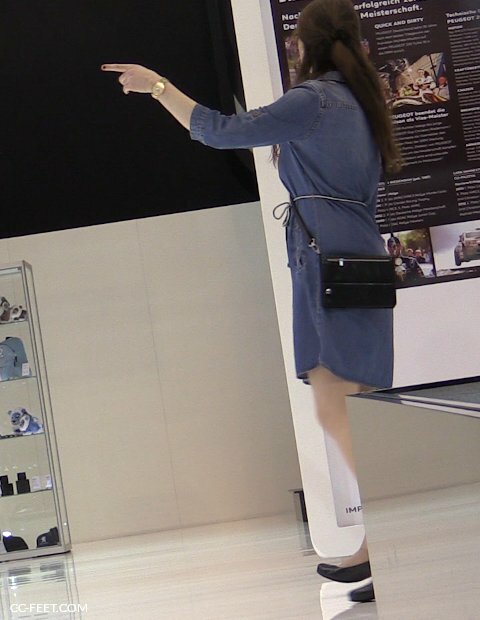 You know, motorshows are a rather good place to capture some shoeplay. Not that wonderland as one would guess, but there are usually one or two girls who do some action. Maybe even more, unless you consider the people walking around you. And surely you want to stay undiscovered. Then I saw this brown haired girl. A short jeans dress, black pumps and a tan colored nylon pantyhose. She was walking up and down, from left to right and popped her heels out of her shoes here and there. But there was no place to hide so I simply sat down right next to her. I really don’t want to know what the people of the booth thought, especially the girl. They must have been guessing a strange kind of pain in my back or legs as an explanation, why I barely moved. Or maybe a mannequin challenge? Nevertheless, I wanted to get her play. With two cams at once, which was the difficulty level 100. And I got her. Every move, every heelpop and every bit of her dirty, well worn nylon pantyhose. I was shivering. After a while of heelpopping and playing she changed her pumps and came back with trashed black flats. Heaven! The hostess walked as if the flats were slippers. She used the white floor as her personal acting place, like a ballerina on ice. Eventually I left the place. I hobbled away and didn’t turn around. But at home I decided to visit the show again, maybe I could get some more footage? So, another day in paradise, because this girl was wearing the same dirty pantyhose as the day before I mean, think what an awesome job it would have been to be the guy who is allowed to worship these stressed feet after those long days of walking in pumps and flats? This whole clip is 37+ minutes long, all three parts equal in time. Enjoy!